Short Story: It was a very successful ride by most measures. Company was great, route was good, scenery pleasant, and most drivers courteous. Weather was only so-so, and a few minor warts in the route were uncovered, but the ride was well worth doing. Most importantly, no injuries, mental or physical, were endured. And I’d say we broke the minimum 66.666% Type I Fun threshold, if only by a slim margin. 189.9 miles. 9,600 feet of climbing. No mechanicals. No bonking. Longer Story: Dan, Bill, and I got up at 5:00 AM or so, a mere 4.5 hours after Bill and Dan arrived at my house the night before to crash on the couch. It kinda hurt. Coffee and greasy breakfast sandwiches were consumed and we got rolling at around 6:30, one whole hour later than we planned. Given that this was not an official rando, we didn’t really care much. But we knew the later we started, the later we would finish that night. And Eric Keller was going to meet us about 35 miles into the course. And we didn’t want to mess with him too much schedule-wise. 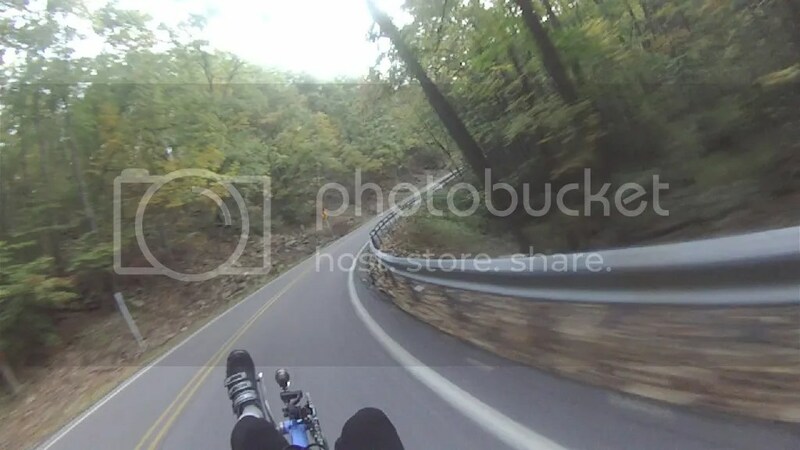 We rode through a quiet downtown Altoona and ascended the 600 feet up and over the Kettle. Due to our tardiness, the normally fast and fun descent down the Kettle road was fast and fun, since we did it in daylight. Who says laziness doesn’t pay? The ride to the first stop in Warriors Mark was very quiet and very scenic – some of the nicest roads around, I think. We did our thing quickly at the rest stop and set out to meet Eric. I had texted him a couple times to let him know of our revised schedule and we met up with him a few miles before we turned onto the (dirt and gravel) Scotia Range Road. The segment on Rt. 550 to Bellefonte had a bit too much traffic, and Eric directed us to a minor detour that helped eliminate a little bit of it as we approached town. After scooting past the Centre Co. Courthouse (paparazzi and media now gone…..) we headed up to the portion of the route that had me most worried – safety-wise, that is. We didn’t have a lot of choices given the overall route design to make it north of I-80 other than the interchange with I-99. We got through it ok, but I was a little nervous. It wasn’t quite as bad as I thought it would be. One particular big rig driver was helpful in shielding us from other traffic as we made it through the tightest spot just after the I-80 underpass. We stopped at a truck stop in Lamar a bit further down the course and experienced the handiwork of the slowest sandwich artist in the universe. Nice lady, but sooo slooow at sandwich making. Taking our leave of that fine town, we turned onto Narrows Road, which is a beautiful road in an even more beautiful gorge. Views of the steep hillsides, lush treecover, the babbling brook, etc. made it too good to miss. In fact, the whole route was more or less designed to take us through this area then back home again. It was just happenstance that the route ended up being a 300K, almost perfectly. The following segment spent on Winter Road, both western and eastern portions, was quite nice too. We hit Rt. 192 for what was to be a 22 mile section that I thought would pass quickly, as when I have been on this road in the past, you could usually move along in the low 20’s. But on this day, it wasn’t happening. We had a good 10 mph headwind in our faces. We managed 15 mph or so with a fair amount of effort. That hour and a half seemed like an eternity. The views in this area are nice, but too uniform and unchanging. Lots of friendly plain people along the road. Lots of kids who liked to wave, and we wave back, of course. But I have to admit I was so bored by this segment that at one point I swore we had passed Geddy Lee dressed up as an older Amish woman on a kickbike. If she had a Fender bass on her back, I would have stopped for her autograph. We stopped in Centre Hall for a pizza dinner, since several of us didn’t really welcome another Sheetz meal. Randos love Sheetz, but sometimes Sheetz doesn’t love us back. Shortly afterwards Eric was basically home so he took his leave of Bill, Dan, and I. Then the sun came out. A minor miracle since the most of the day it had been cold and gray. After a brief stop at Sheetz for on-the-road-food, the three of us soldiered on southward and ran into Rob Gentry of RBR fame (www.rbr.info), not far from Rob’s house. Since Dan and I were both riding Metabikes, he took the opportunity to take our pic for the RBR facebook page. Kinda nice how stuff sometimes works out. We found our way onto the Lower Trail about 45 minutes after sundown, and again found ourselves bored stiff by the monotony. Worse than the Rt. 192 section, even. The trail was so dark, there was even less to see than there is in daylight. Well, at least no drunk drivers could hit us while we were on it. Confession: I pretty much hated the last 30 mile or so. Most of the day had been fun, but this wasn’t. Just had to get through it. So we did. We unceremoniously finished at around 10:30pm, I believe. From Silver Barn Road in Sinking Valley. Note the fog in the valley below. It was damn cold down there. Photo by Dan Blumenfeld. Climbing up Hundred Springs Road. Photo by Dan Blumenfeld. Reddan on Scotia Range Road. A little mushy but not too bad. Here comes the sun. Better late than never. Route Notes: The route was supposed to have about 6200 feet of climbing (according to one particular mapping site), but my Garmin showed 9600 feet at the end of the ride. Hmph! Which is wrong? 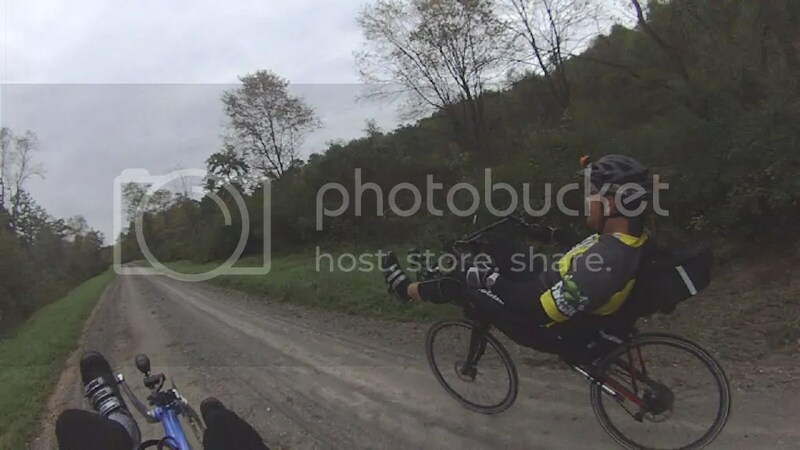 I am thinking this route is a keeper and will do it again someday, so I have some changes to the route in mind to make it even more pleasant: 1 – Eric’s suggestion of taking Valley View Rd going into Bellefonte in lieu of 550 the whole way from Waddle. This will cut out about 5 miles worth of Rt. 550, which had a little too much traffic for my taste. 2 – We can cut out half of the long, boring slog down Rt. 192 by cutting over to Millheim on Rt. 445, then take Penns Creek Rd over to Spring Mills, then taking some really nice familiar roads back to Boalsburg that go out near Colyer Lake. We’ll miss the pizza joint in Centre Hall this way, but it’s better than spending additional 35 to 45 minutes on Rt. 192. 3 – Near Lamar, rather than taking Browns Hill Rd, we’ll take Eric’s suggestion of Dotterers Rd, which dumps us onto Rt. 64 at a traffic light which will make turns a little less hair-raising in heavier traffic conditions that this area can see sometimes. It also avoids having to ride past the interchange with I-80 completely (unless you wanted to go up to McDonalds for some gastly reason.) Item 2 will add distance. With that change, this route will get very very close to a double century. 200 miles is a nice, satisfying benchmark too, of course. Gems for the keeping are Kettle Road the the rest of Sinking Valley, the climb up Hundred Springs, and Narrows Road and Winter Road in the segment right after Lamar. Low points that we can’t easily do much about include the Lower Trail (mind numbing in the dark after the previous 11 hours in the saddle…er, I mean seat) and the slightly hair-raising interchange where I-80 meets I-99 just north of Bellefonte. Equipment Notes: This was my first long ride on my new Metabike MetaPhrastic. I used 26″ wheels borrowed from my Bacchetta because I wanted to run my dynohub and light. Otherwise, I would have been on my 700C wheels. The 26″ wheels also had 1.35″ Schwalbe Kojaks, which made for a very nice ride on several roads where the 25mm Duranos I have on the 700C wheels would have rattled me pretty badly. I am still shopping for some fat and fast 622 rubber. My only gripe is that my elbows are very slightly sore from the ride. I never get this from the open cockpit bars on my other bikes. I have starting taking a liking to the preying mantis setup in general, but straigher arms are more comfortable over the long haul for me. I may end up changing the Meta to open cockpit at some point, but the urge is not too strong. Overall, I am very very pleased with how the bike rode and performed for me. I am sure I will do most of my rando rides on this bike. It climbs well, and it handles well, even when brain dead at mile 189.8.